HMS Duncan has visited Odessa - the first Royal Navy warship to arrive in the Ukrainian port for eight years. It's the latest in a series of port visits and exercises conducted by Portsmouth-based warship in the region. The Royal Navy says the Type 45 destroyer is leading NATO’s Standing Maritime Naval Group 2 providing reassurance and deterrence in the Black Sea, as well as commanding NATO’s counter migration activity in the Aegean. For the next 12 months, the Royal Navy is commanding two of the four NATO Standing Naval Forces, demonstrating the UK’s commitment to and leadership within the alliance. The visit follows the announcement last week by defence secretary Sir Michael Fallon that the UK is expanding its training of the Ukrainian Armed Forces with new military courses on countering threats from snipers, armoured vehicles and mortars. He said: 'HMS Duncan’s visit to Odessa this week is a symbol of our unwavering support to our Ukrainian friends in the face of Russian belligerence and aggression. Before docking in Odessa, HMS Duncan led the NATO task force through one of the largest naval exercises staged in the Black Sea near the Bulgarian port of Varna. A Ministry of Defence spokesman said: 'Exercise Breeze 17 tested naval forces from Bulgaria, Turkey, USA, Italy, Poland, Romania and Greece alongside UK military personnel in their ability to safeguard Black Sea shores and shipping, strengthening the Alliance’s readiness and experience of joint operating. 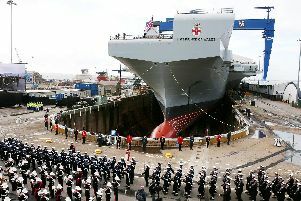 The ship's deployment has brought pride to the Portsmouth workforce that helped build her. Edward Sheldon, Head of Type 45 Class Output Management, BAE Systems Maritime Services, said: “We are all extremely proud to see HMS Duncan take up such a high profile and important role within the NATO group, particularly as this is the first time a Type 45 Destroyer has ever held such a position.